Instead of playing tennis, Enrique Iglesias chose to play table tennis. 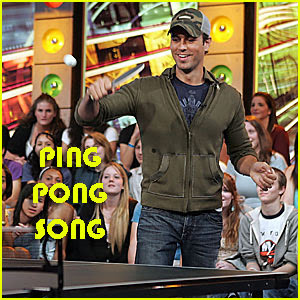 The picture above shows Enrique's appearance on TRL playing ping pong against MTV VJ Damien. His latest song, Do You Know (Ping Pong Song) is quite a catchy and infectious song. If you like his songs such as 'Escape' and 'Bailamos', you are definitely going to love this one. You can listen to this song which is at the sidebar of this blog. If you listen carefully, a ping pong ball is really used as a percussion instrument in this song. So far I have never missed a single album by Enrique. The album is already available in the local music stores. So going to check out the album soon. Updates: Enrique Iglesias is still dating former tennis star, Anna Kournikova.